Yes, Trump has certainly made broad promises that seem to be predicated upon comprehensive government but, as Salena Zito figured out, Trump voters understand the difference between campaign promises and reality. What they also understand is that, provided that they have a sympathetic friend in the White House, the most important thing is to return economic growth to America — and that one of the best ways to do that is to shrink government, not expand it. In addition, because business growth works best in a world with reliable rules, voters are happy about Trump’s promises to enforce American laws as written (such as her immigration laws) rather than ignoring them in favor of coastal elites’ mores. Trump supporters therefore take with a grain of salt his sweeping promises to renew the world and take seriously his promise to get government off their backs. Trump reiterated his core promises in his excellent inaugural address (which gained him even more support from ordinary Americans) and seems to be keeping those same promises — less government from a more law-abiding administration — in his first days in office. Just off the top of my head, he’s rolling back what regulations he can, defanging Obama care, stopping American funding for international abortions (why should we pay for them, especially now that the Dutch have suddenly announced that they’re perfectly capable of doing so? ), enforcing our immigration laws, firing rogue employees (e.g., at the VA), and freezing federal hiring, along with a promise to shrink the federal job rolls and decrease taxes. 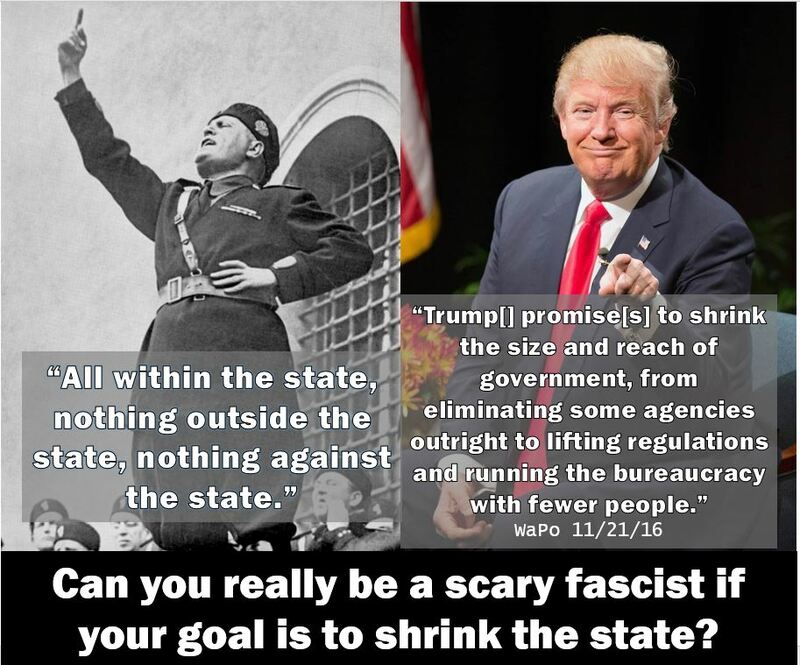 Trump’s promises and actions are the opposite of Mussolini’s promise of a world that would see “all within the state, nothing outside the state, nothing against the state.” That world, of course, was Obama’s (and Hillary’s) vision. I’m sure that both Obama and Hillary imagined that they would inaugurate a a sweet and loving statism, unlike the violent repression that characterized fascism in the 1930s. However, as the insanity the Left has unleashed since the inauguration reveals, statists really don’t do sweet and loving. They may throw sweetness and love about as rhetorical concepts when they leech freedom and money away from citizens, but at bottom they’re always about brute force. And here’s the deal: If a small, weak government engages in brute force, especially against a constitutionally armed citizenry, that small, weak government is history. However, if a huge, overarching, comprehensive, far-reaching government engages in brute force against an unarmed citizenry that has had its freedoms drained away . . . there’s your fascism. And that’s not Trump. Is Trump a populist? Definitely, insofar as he is responsive to ordinary people’s needs rather than trying to create a utopia predicated upon the visions of a global elite. But a fascist? Most definitely not.